The third and final book in the selection series is one I have really wanted to read for a while now. I must say I am pleased with how it turned out. When I first started reading this series I thought for sure that The Selection (book 1) would be the only book in the series. Imagine my surprise when there is not only one but two more books! In the beginning I wasn't sure how Kiera Cass could write three books from what I'd seen in The Selection, but coming to the end of this journey I now see a wonderful and fully formed story. The Selection trilogy felt like one story all the way through, which speaks of a lot of planing before hand by the author. This is something that I feel like doesn't happen often enough with trilogy's these days. It seems to me that lately authors (mostly YA authors) write a trilogy because it's popular and not because it's what their story demands. I didn't feel this with Kiera Cass's Selection series, something I am immensely grateful for. Now I'll step off my soap box and give you a review of the book. The One picks up right where The Elite left off, with America working out a plan to enact her new found determination to win. Things between her and Maxon still have their ups and downs through the book, and Aspen always seems to pop up. But things are changing, and America is finally starting to push back. Many of the relationships in this book grow and change, and not just America's relationship with Maxon and Aspen, but also her relationships with the remaining members of the elite, her family, Maxon's family, her maids, and even a few new characters all go through major changes and testing. I found these growing relationships even more interesting than the main love story because I got to see a new part of many of the characters. We get a deeper look into the other elite girls and I found myself growing to really love each of the girls, including Celeste. I loved getting to see America's family again as well as getting to know some of the new characters. Overall I really enjoyed the character development in this book, Kiera Cass did a wonderful job of keeping the relationships realistic over the course of the book. The story was so much more than just America's love life, but at the same time the unrest in the country didn't overwhelm the story. It was used to propel the story but it never took over this romance completely. 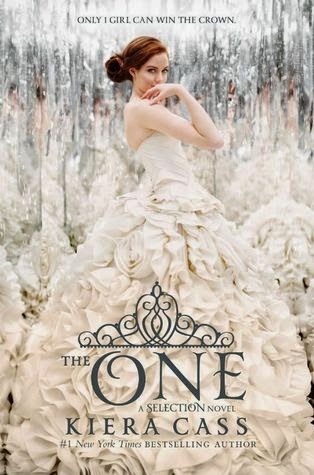 One of the things I really liked about the Selection series was that it was overall a romance story. Yes it had it's dystopian elements but they never overwhelmed the story like I've seen happen. Kiera Cass made sure to keep the books true to the story she was telling, and that was America's journey through the Selection. That said, I loved everything we got to learn about the rebellion and what was going on in the kingdom. It was very interesting to see what was going on behind the scenes and get to learn a little bit of each sides intentions. There wasn't anything I really disliked about this book. The romantic scenes got to be almost a little much at times, but they never went too far or got too mushy for me. I enjoyed America's struggle with saying I love you though, it seems to be something I think a lot of people deal with in relationships. When is the right time to say it? Who should say it first? These were questions she struggled with and their eventual resolution left nothing to be desired. Overall The One was a great read and an excellent conclusion to the Selection trilogy. I would love to see more books by Keira Cass and would recommend anything she's written. If your new to the Selection series or just trying to decide if the finale is for you I say read them, read all three and you won't be dissapointed.